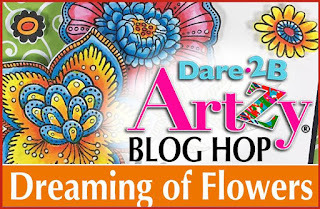 Welcome to Dare 2B Artzy's Blog Hop! A few of the design team members are using previously released floral stamps sets, and a few are using two of our newly released sets. If you haven't had a chance to see the newest two floral stamp sets, be sure to check out "Wishing Happiness" and "Playful Posies"! They are beautiful and so much fun to use. You should have arrived here from the talented Pam's blog. 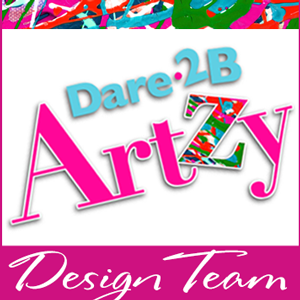 If you didn't and would like to hop along, please go back to the Dare 2B Artzy blog to start at the beginning. Be sure to follow each blog and leave comments along the way for your chance at winning! We will randomly choose a winner from one of the blogs, so the more you comment - the more chances you have to win!! The winner will receive a stamp set and ink pad of their choice. 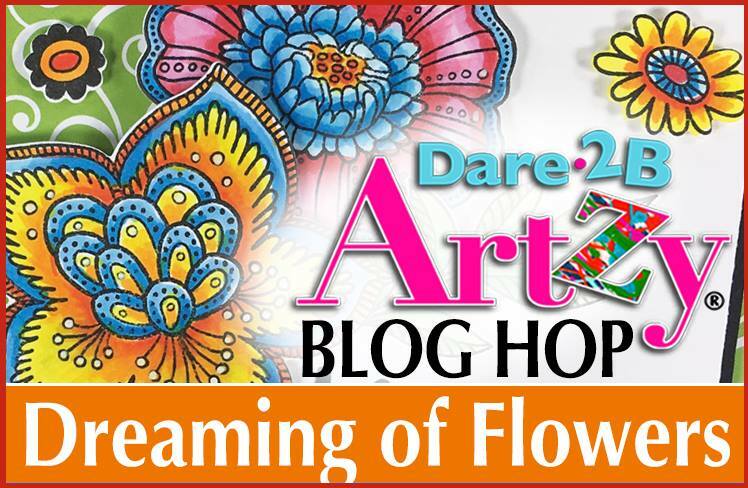 The blog hop will end Sunday, Aug 27 at 7 p.m. Eastern. We will then post a winner. I did a very patriotic flower for my project using the Blissful Blooms Stamps and the Fields of Joy Collection Paper Pack. I colored it with the following Copic markers: C1, R24, R27, R29, YR12, YR14, YR16, B12, B14, B16. I'm sorry I didn't get a close-up of that beautiful bloom. I'm in the process of moving and frankly forgot to take it before I packed up my belongings. Check out all of D2BA's products - here. Happy Hopping!! Beautiful card with all that lovely coloring and paper! 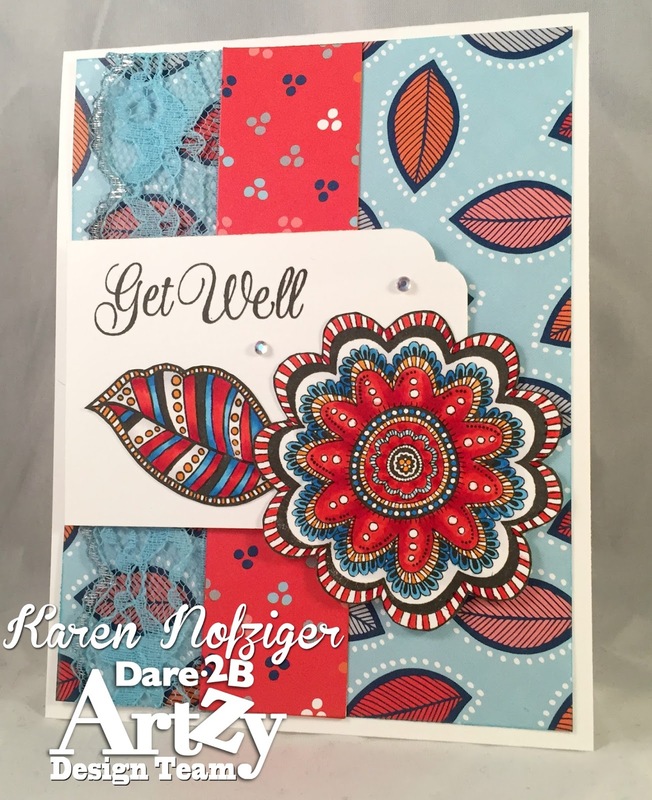 I really like the colors and how well they work with the Dare 2B Artzy papers! Beautiful card I just love the bright colors and added lace! Love love the color combo! 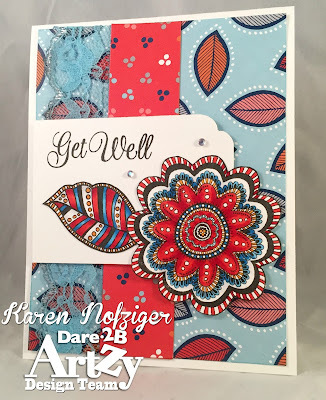 I just love your red, white and blue color combo and whimsical card design. It reminds me a bit of a bandana...so cute! Love your color choices for this beautiful bloom! So Pretty Karen! LOVE the floral bloom! Hope you have a wonderful weekend! Karen, I love your card and the colors you used on the flower. Gorgeous!! This flower just POPS with awesome color! I love the copic coloring. This is so colorful and well designed. Thanks for sharing it. Pretty colors used plus I love your touch of lace. Good work! Pretty card with beautiful coloring.